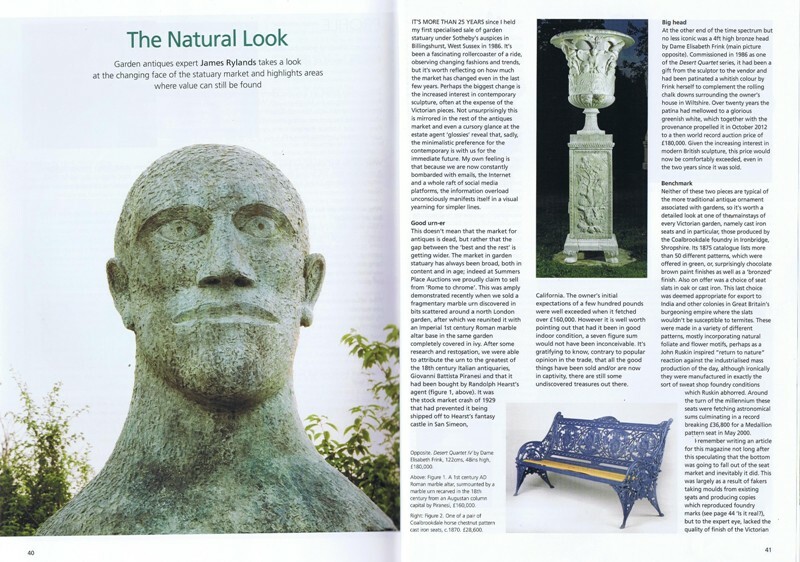 Garden antiques expert James Rylands writes in detail about Coalbrookdale garden furniture in the July/August issue of Antique Collecting magazine – an interesting article that’s well worth a read if you can lay your hands on a copy. 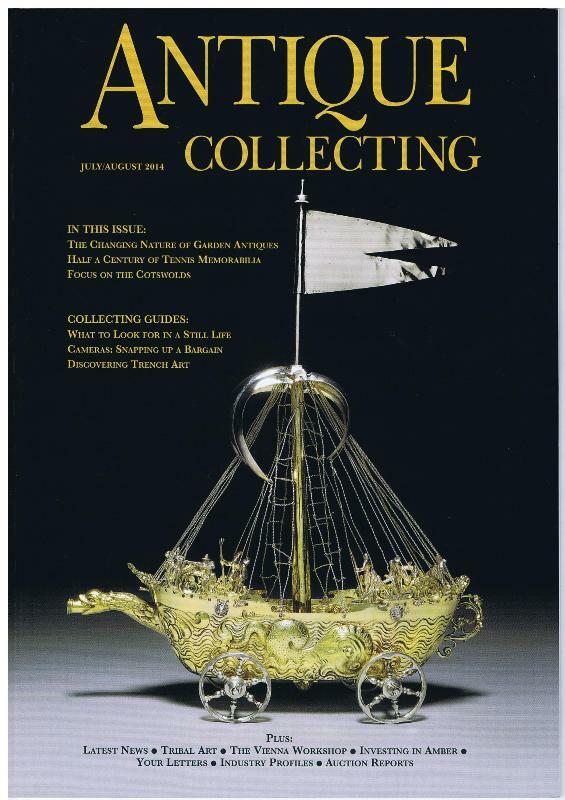 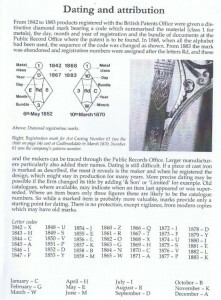 The magazine is published by the Antique Collector’s Club www.antique-collecting.co.uk 01394 389 950 We were approached by the magazine to offer advice on the restoration of Coalbrookdale furniture and Ironart’s Martin Smith is quoted in the article. 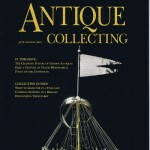 James Rylands been involved in antiques from 1979 when he joined Sotheby’s. 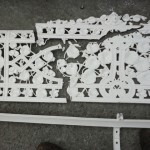 In 1986 he set up the Garden Statuary department in Sothebys Sussex. 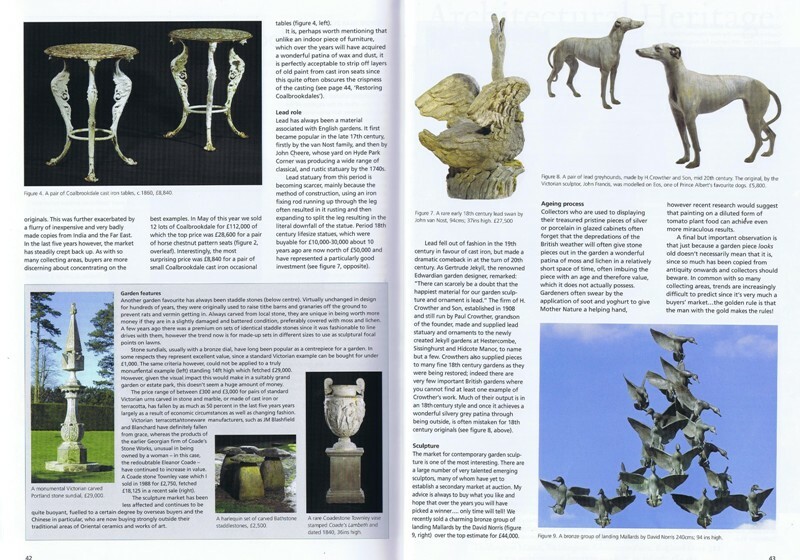 He is the co-author of a book on garden ornaments and the founder of Summers Place Auctions in West Sussex, which specialises in garden statuary. 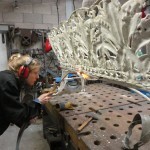 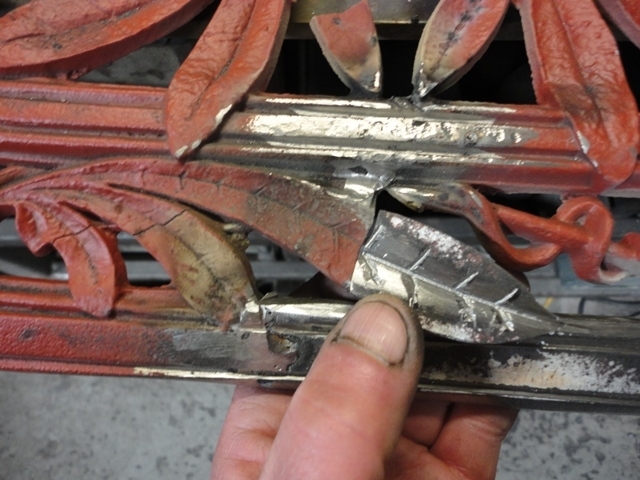 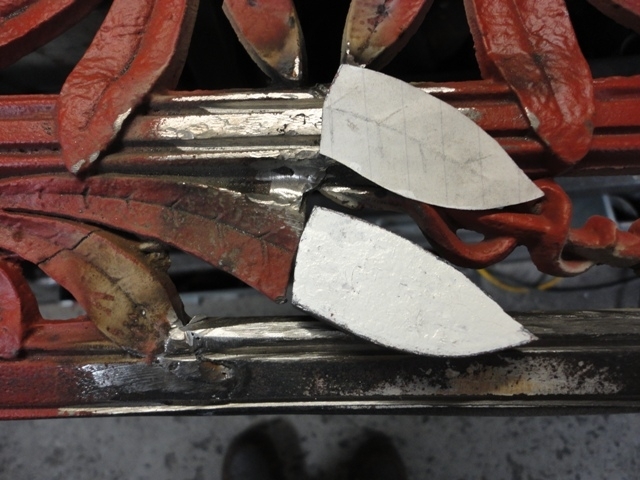 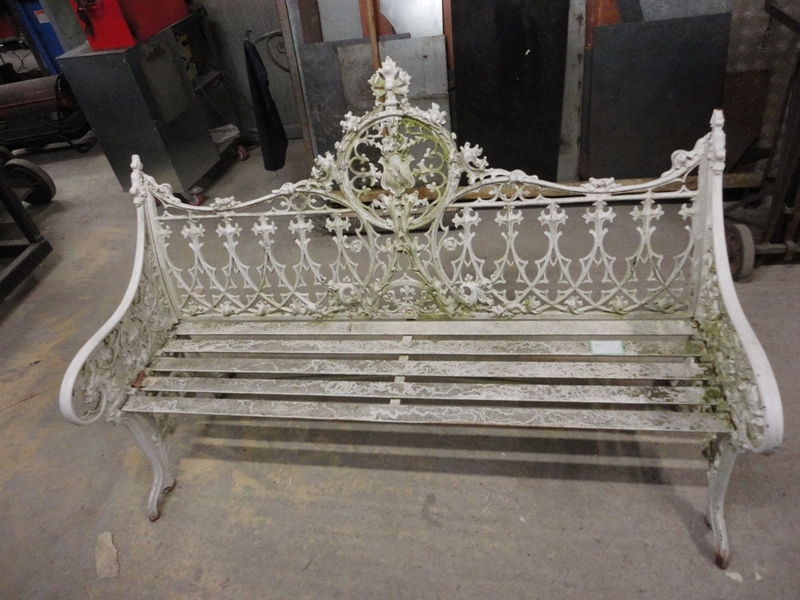 For more information on the restoration of antique cast iron furniture, please take a look at the Restoration area on our website, where you’ll find a portfolio of commissions. 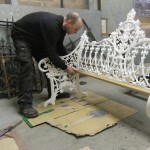 If you have any questions or want some advice about restoration, please get in touch. Some happy snaps taken today showing the diversity of projects on the go here at Ironart in a typical working day! 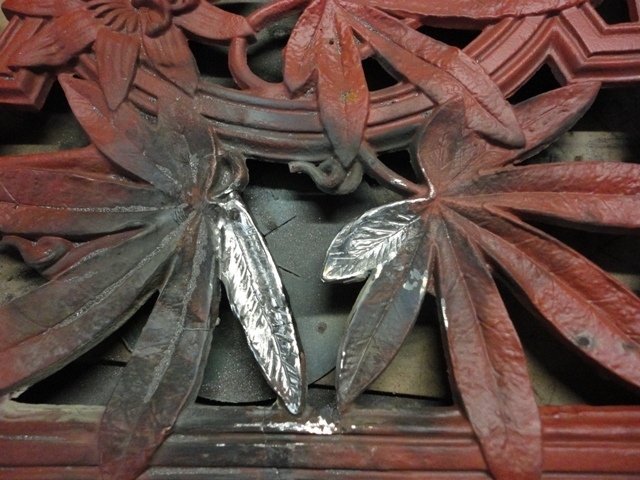 Jason has made this set of three beautiful forged field gates for a wedding venue in Canterbury, Kent which have just come back from the galvanizers. 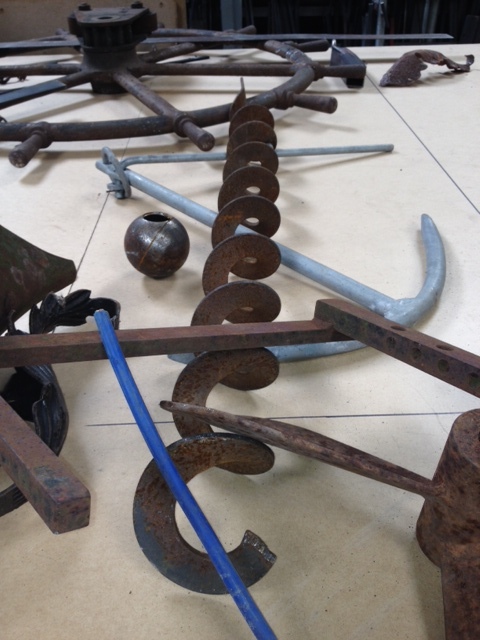 Dom was working on some fiddly drop bolts for a customer while Martin has been busy laying out pieces for an amazing ‘found objects’ entrance gate which will grace the entrance of a cool revamped pub on Colston Hill in the heart of Bristol. 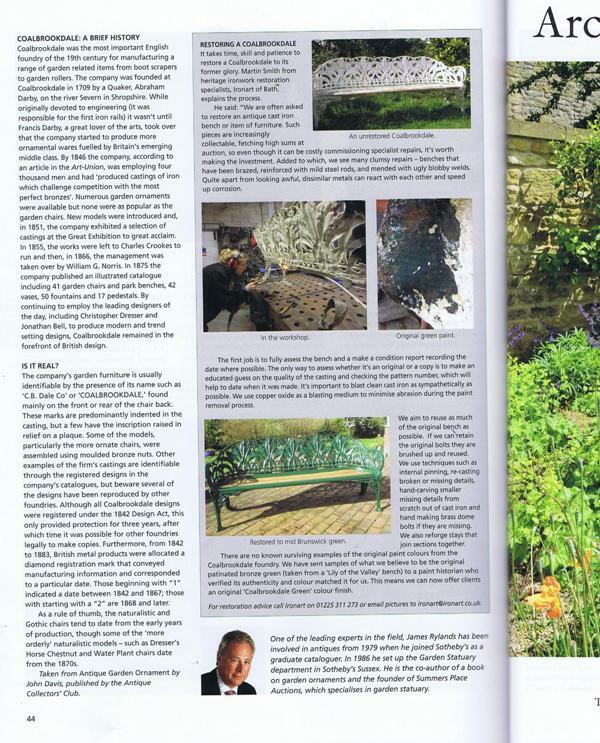 This project has been commissioned by local interior and garden design firm Woodhouse & Law. 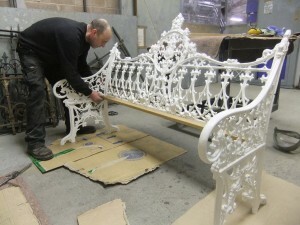 We can tell that Martin is in his element working on this project because he’s been singing non-stop since he started work on it. 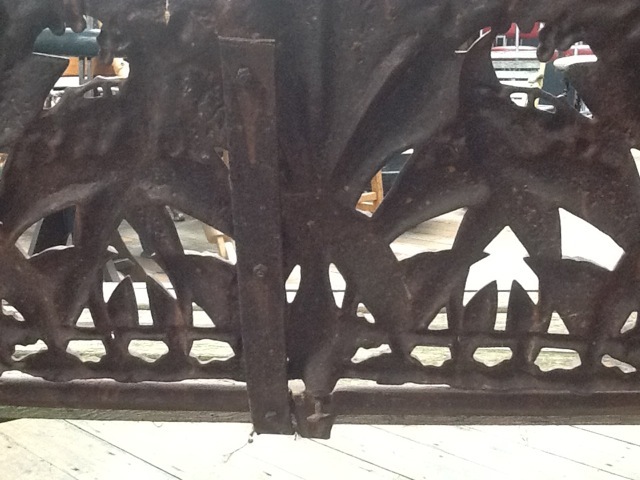 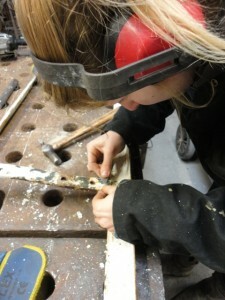 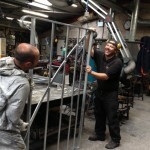 The gate will evolve as it comes together – we’ll keep you posted as he progresses it. 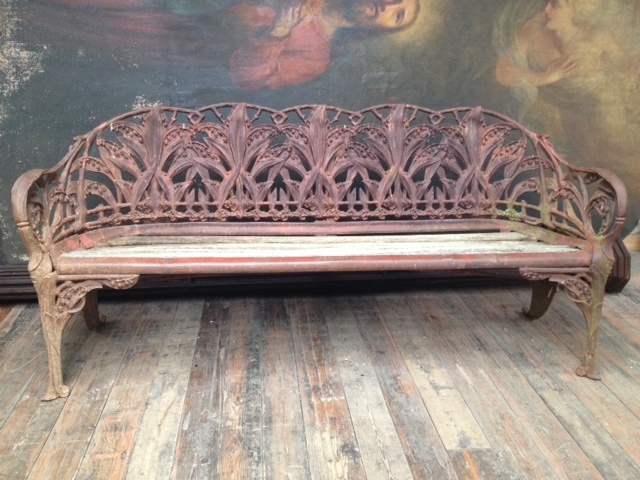 He’s also working on two antique Coalbrookdale benches, one Lily of the Valley three seat bench dated 1864 and a huge 6ft long Nasturtium bench – never a dull moment! 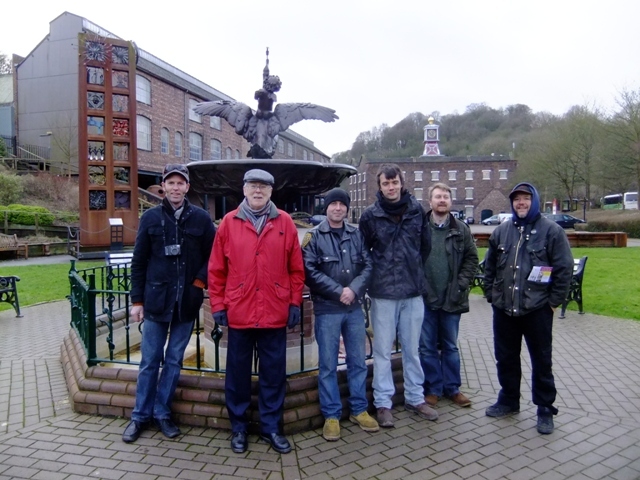 Last weekend a group of us headed up to Ironbridge to the Museum of Iron to meet the esteemed John Powell, retired curator of the Coalbrookdale collection. 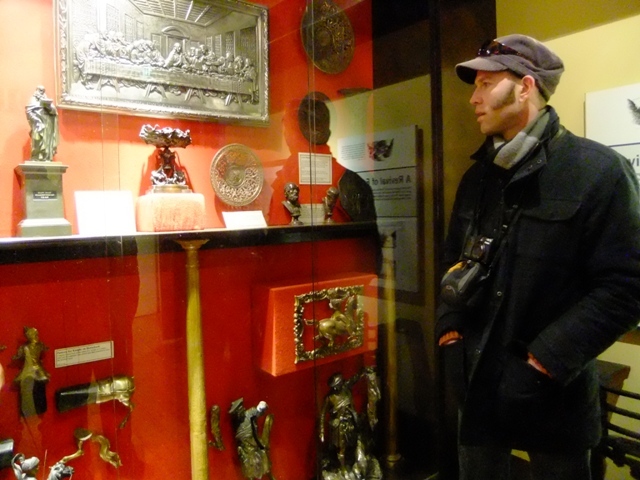 John very kindly gave up his entire morning to give us a guided tour of the collection and to share his knowledge with us. 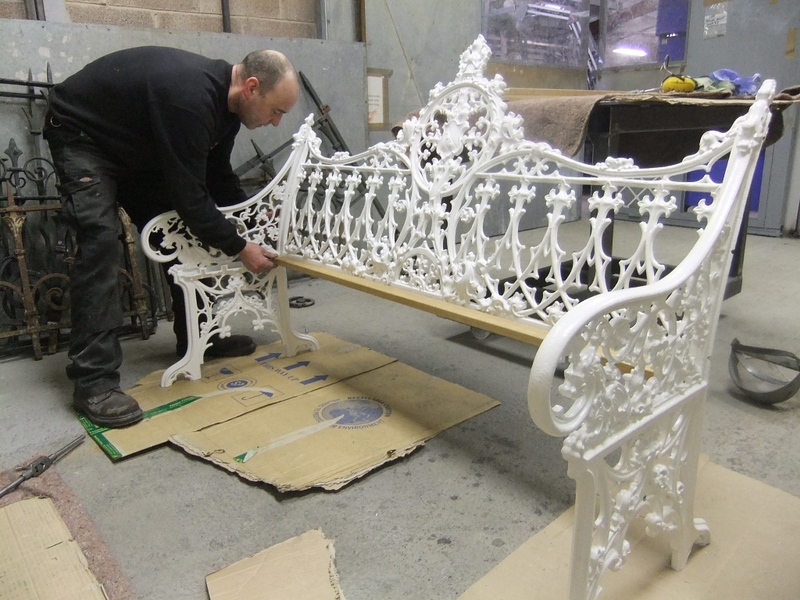 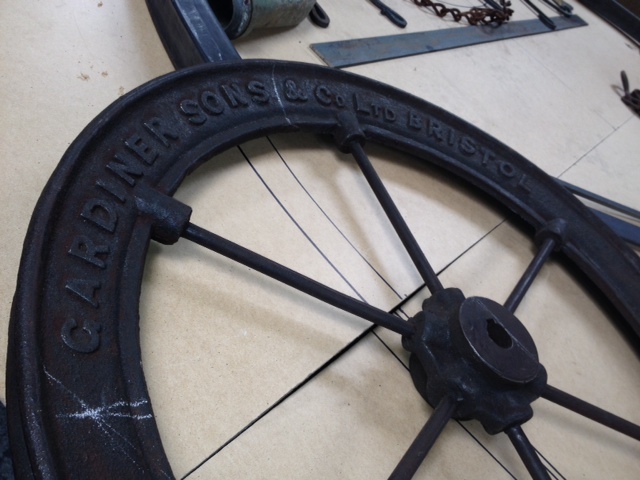 This was of particular interest to Martin Smith, restoration specialist here at Ironart, as Martin is largely responsible for the restoration and repair of all the cast iron furniture within the business. 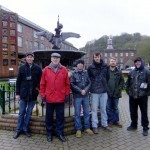 His knowledge is already extensive and we all learnt a lot from the vist. 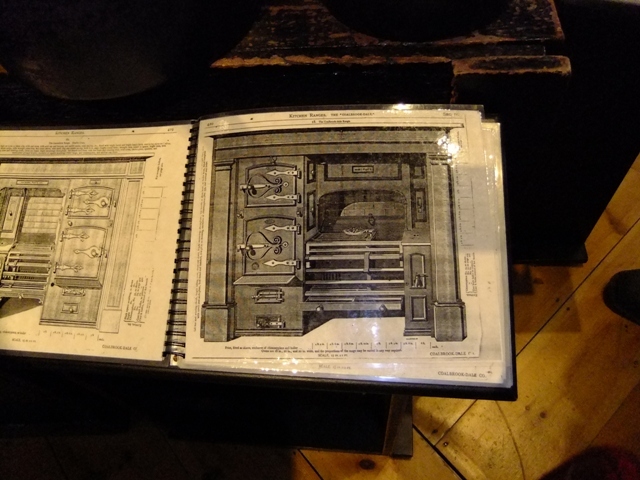 Sadly, according to John, there is only a limited Coalbrookdale furniture archive available in existence as a vast number of the original records from the Coalbrookdale Foundry were deliberately destroyed in a family feud. 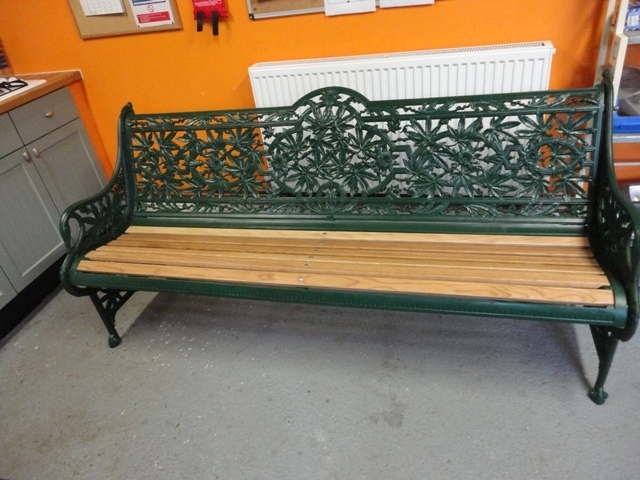 The restoration team recently completed the refurbishment of this lovely three seat Passion Flower pattern Coalbrookdale cast iron bench. 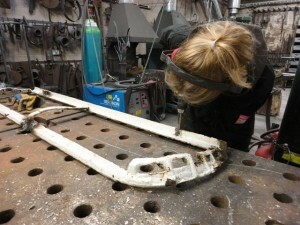 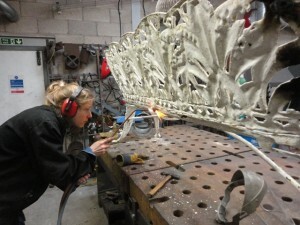 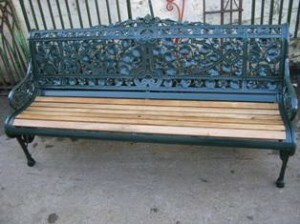 The bench was missing several sections which had broken off over time, which Ironart’s Martin Smith cleverly recreated. 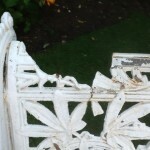 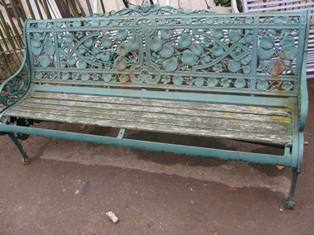 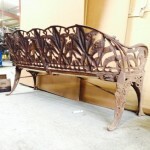 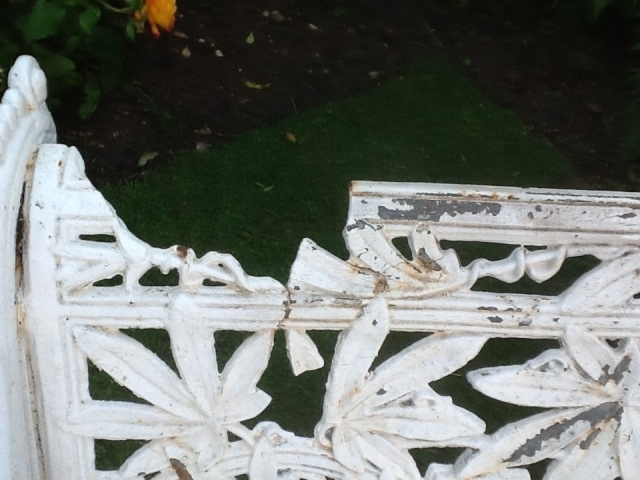 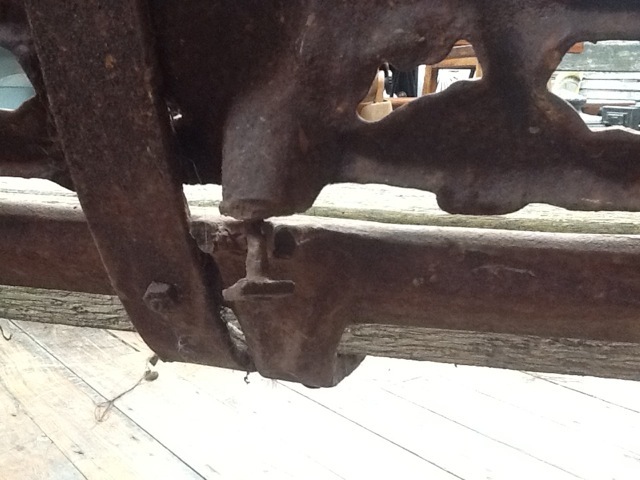 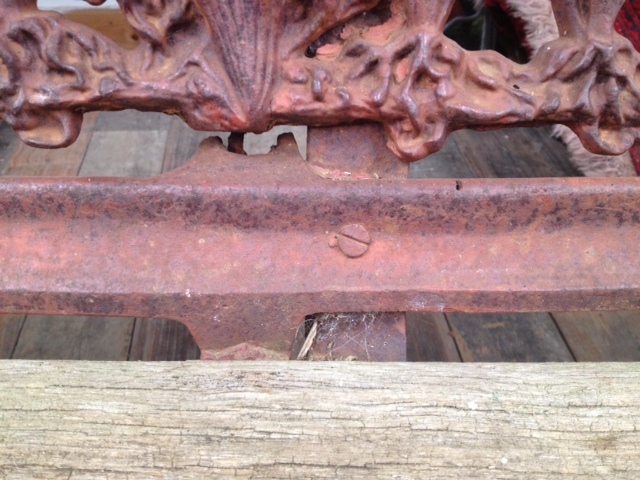 If you have an antique cast iron bench that is in need of repair, and would like some advice about the cost of renovation and the processes we use, please get in touch. 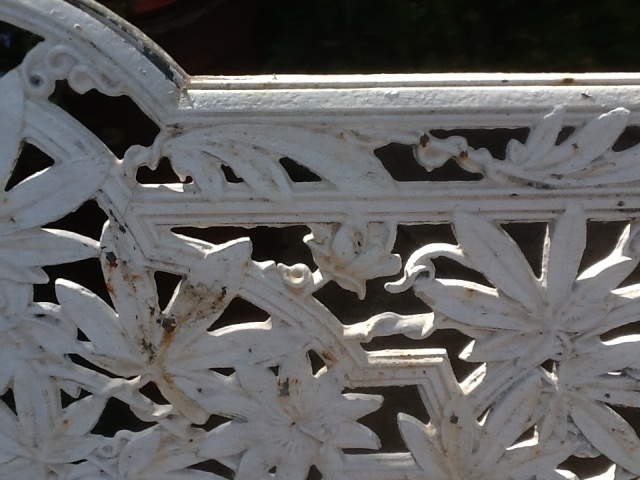 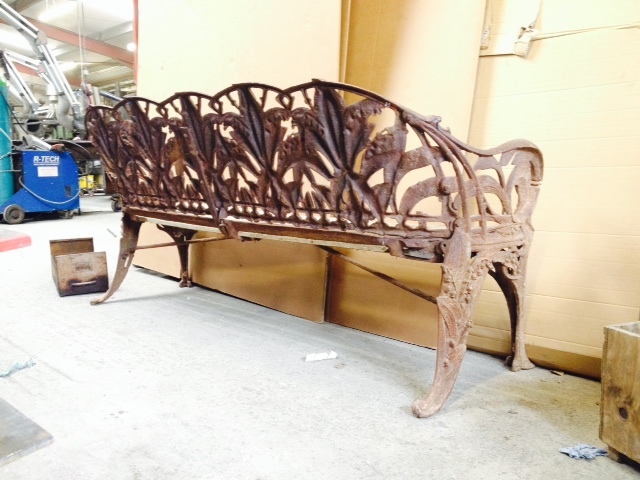 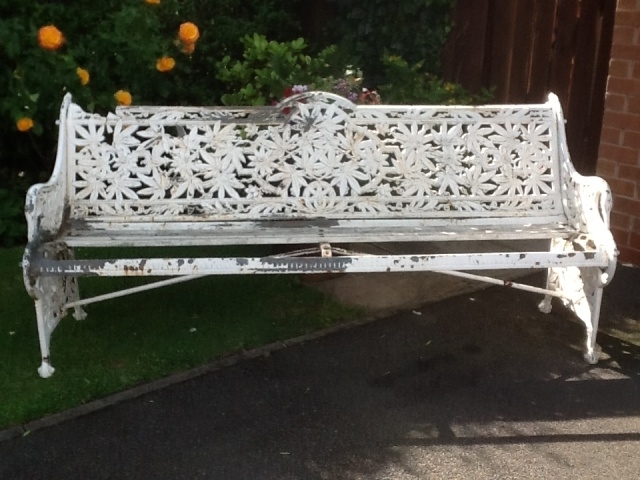 We have a beautiful Coalbrookedale Lily of the Valley bench in for restoration at the moment. 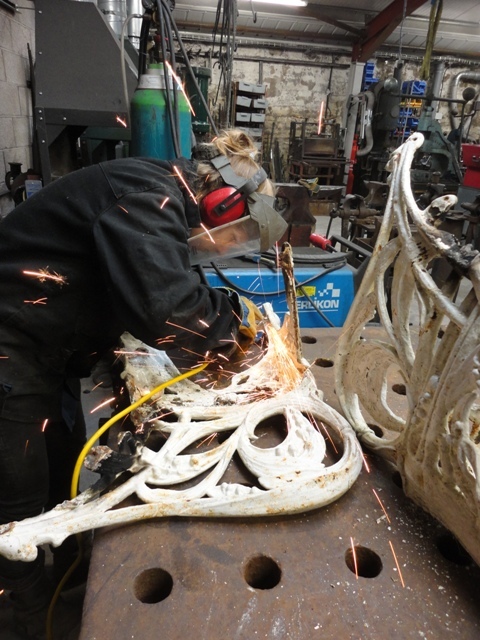 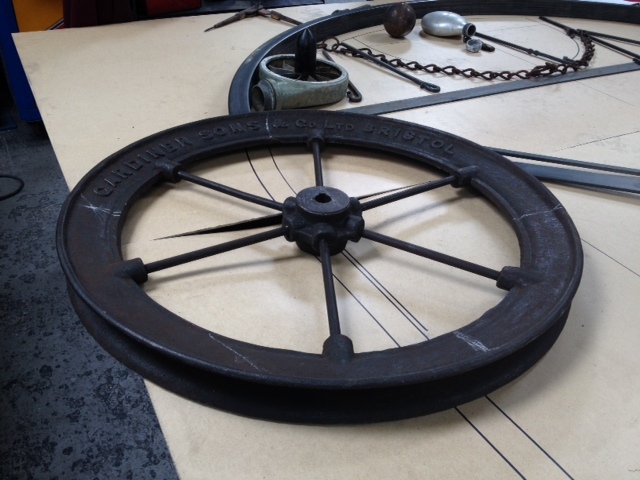 Martin Smith and Ironart’s Conservation Apprentice – Cecilie Robinson have carefully disassembled it in the workshop ready for cleaning. We are regularly asked what colour these benches would originally have been painted, and have done a fair bit of research on the subject. 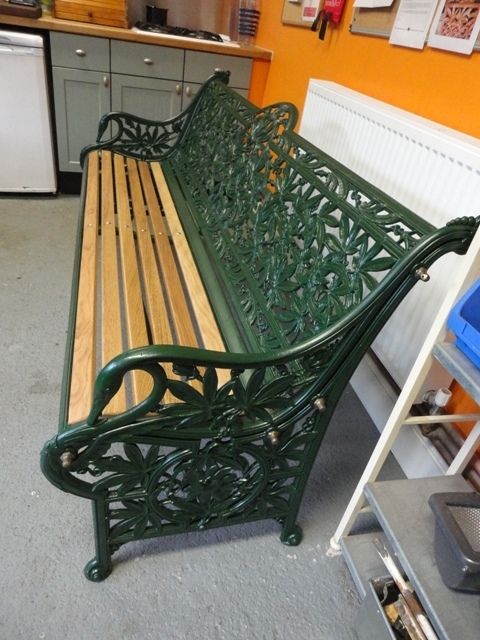 The Museum of Iron at Ironbridge where these benches were made, have no surviving examples of the original colour schemes so it’s been impossible to colour-match the original paint. 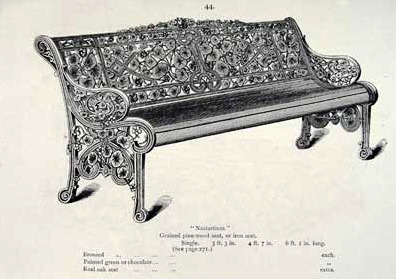 In her book ‘Decorative Ironwork’ author and Curator at the V&A Museum Marian Campbell states that Coalbrookedale benches were “originally painted brownish to imitate bronze or green for patinated bronze”. 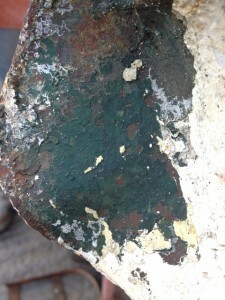 This bench (yet to be accurately dated) has revealed two shades of dark bluish-green right next to the metalwork – tucked away underneath where it wouldn’t have been bleached by the sun. 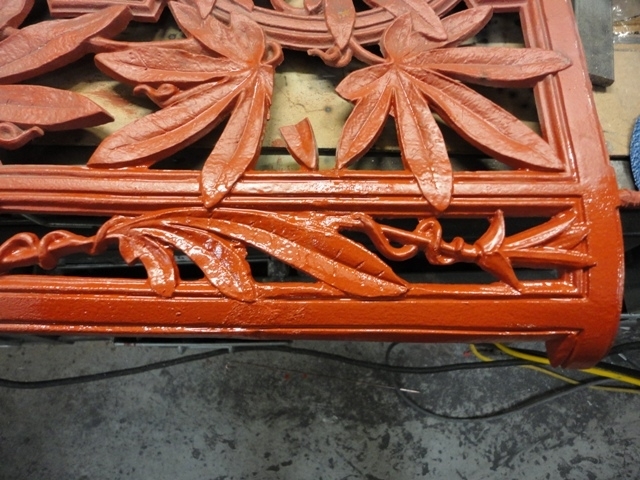 This is certainly the closest WE have come to being able to accurately specify an original colour. 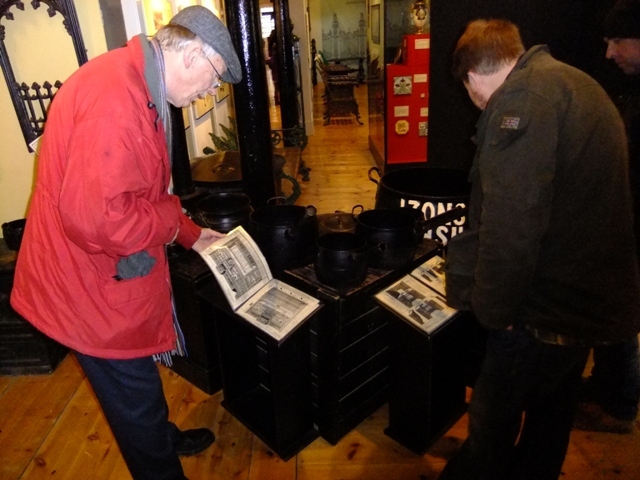 For more information on Coalbrookedale take a look at the Museums website. 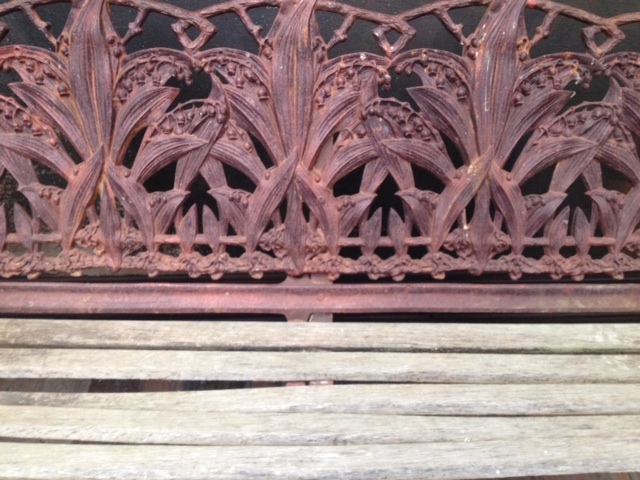 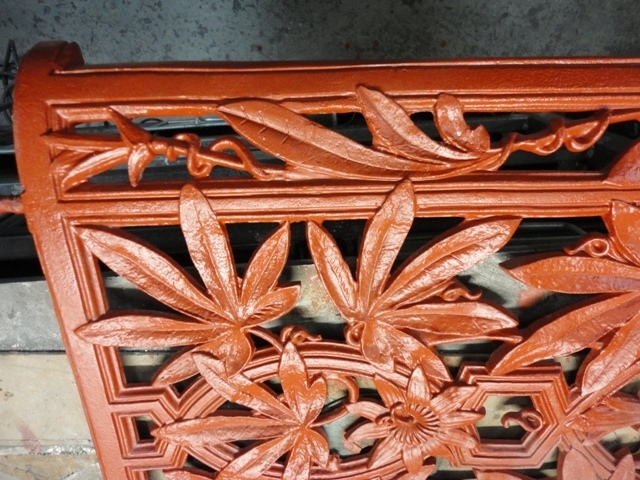 To see examples of antique cast iron furniture we have restored, follow this link.